New World Supply, where S.D. Standard Drilling (SDSD) has an ownership of 26.2 percent, has completed a sale of two of its six medium sized platform supply vessels (PSVs). According to the Cyprus-based company that offers offshore drilling services to the oil and natural gas exploration industry, the vessels, World Sapphire and World Emerald, have been in lay-up in Spain since October and November 2016. The purchase price, which remains confidential, has been fully paid for both vessels. The transaction is done at a level that reflect significantly higher vessel value compared to SDSD's book value and acquisition price of the shares in New World Supply Ltd.
SDSD consider its holding in NWS as a financial investment. Following the above mentioned transaction, NWS owns four medium sized PSV vessels built in 2013. 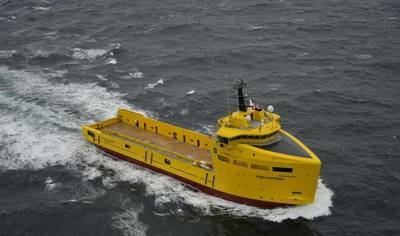 "Northern Supply AS (previously PSV Opportunity AS and Northern PSV AS), where SDSD has an ownership of 25.5 percent, has completed a sale- lease back contract for FS Arendal (2006). FS Arendal was sold for $2.8 million," said a press release. Northern Supply AS has entered into a one year bare-boat contract (1+1 year option) with the buyer at day rate $0 per day and with a 50/50 profit split at net hire between £5,100-10,000 per day. Northern Supply AS has received the total transaction price. The buyer is responsible to carry out and pay for Special Survey/Engine overhaul/DP 2, a cost estimated to be approximately $1.4 million (at buyers risk). This transaction increases the gross cash in Northern Supply AS with $4.2 million compared to not executing this transaction. "These transactions are in line with our expectations of an increase in the value of our assets. In addition, these transactions strengthen the cash position in the company structure, still with no debt, and further enables Standard Drilling to pursue other attractive opportunities within the market the Company operates," said Martin Nes, Chairman of the Board in SDSD. After the transactions SDSD has a 100 percent ownership of five large sized PSV's and approximately 26 percent ownership of 12 medium sized PSVs. Further SDSD has economic exposure in 18 PSVs in total (including the sale-lease back of FS Arendal), where of the four medium sized PSV's owned by NWS are considered as a financial asset. SDSD has no debt.